Angry birds was kinda fun at first too kill time but got old real fast. My bf is currently obsessed with this game. His birthday is next month so I might have to make this and one of the birds for him! hey! 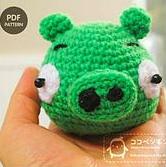 thanks for this very huge collection of free crochet patterns.. it really helps me a lot =).. really.. It's kinda fun doing this stuff plus t also lets me earn here in our place.. love it!!! Good to hear people are still enjoying the links!